by Christopher Marlowe. Introduction by J. A. Symonds. New York, Hill and Wang, 1966 (Mermaid Dramabook). Mass market paperback in purple and orange wrappers. xxxii+344pp. 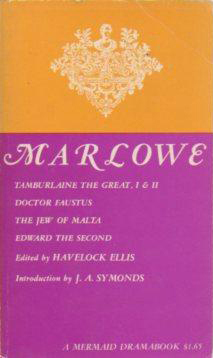 Contents include the plays "Tamburlaine the Great, I and II", "Doctor Faustus", "The Jew of Malta" and "Edward the Second." Mass marklet paperback in purple and orange wrappers. Pages: xxxii + 344 pp.11th printing of original 1956 Mermaid Dramabooks edition. Series Note: The Mermaid Dramabooks series (Hill & Wang, with serial numers MD1, MD2, etc.) is the sister series of the Dramabooks series (Hill & Wang, serial numbers D1, D2, etc.). The Mermaid Dramabooks series publishes reprints of plays whereas the Dramabooks series publishes criticism on the theatre. "Hill and Wang aims to establish DRAMABOOKS [i.e. Mermaid Dramabooks] as a permanent library of the great classics of the theatre of all countries, in an attractive, low-priced format." The Quintessence of Ibsenism: Now Completed to the Death of Ibsen, by Bernard Shaw, New York, Hill and Wagner, n.d.
Christopher Marlowe, edited by Havelock Ellis. Introduction by John Addington Symdons. William Congreve, edited by Alexander Charles Ewald. Introduction by Macaulay. Webster and Tourneur. Introduction by John Addington Symonds. John Ford, edited by Havelock Ellis. Richard Brinsley Sheridan, edited and with an Introduction by Louis Kronenberger. Camille and Other Plays, edited, with an Introduction to the well-made play by Stephen S. Stanton. John Dryden, edited, and with an Introduction, by George Saintsbury. Ben Jonson, edited, with an Introduction and Notes, by Brinsely Nicholson and C. H. Herford. Oliver Goldsmith, edited by George Pearce Baker. Let's Get a Divorce and Other Plays, edited, and with an Introduction, by Eric Bentley. 1958. Introduction: The Psychology of Farce. A Trip Abroad by Eugène Labiche and Edouard Martin. English Version by R.H. Ward. Célimare by Eugène Labiche and Delacour. English Version by Lynn and Theodore Hoffman. Lyrics by Eric Bentley. Let's Get a Divorce! by Victorien Sardou and Emile de Najac. English Version by Angela and Robert Goldsby. These Cornfields by George Courteline. English Version by Eric Bentley. Keep an Eye on Amélie! by Georges Feydeau. English Version by Brainerd Duffield. A United Family by Jacques Prévert. English Version by J.D. Allen.